This Good Catch fish-free pasta with lemon butter wine sauce is a quick and easy dish! Tomatoes, garlic, white wine and capers collide with pasta and a heavy dose of vegan butter to bring you a bowlful of wicked goodness! Bring a large pot of water to a boil. Cook pasta in boiling water according to package directions. Heat a large, deep sauté pan over medium-high heat. When hot, add the oil, followed by the onions and sauté until translucent with a bit of color, about 3-4 minutes, stirring often. Add the garlic and cherry tomatoes and stir well, continuing to sauté for 4-5 minutes until they begin to stick. Deglaze the pan with white wine and allow to simmer for 5-6 minutes to reduce the wine by over half. Add the fish-free tuna, vegetable stock, capers, chile flakes, salt and pepper. Lower the heat down to low to medium and allow to simmer for 8-10 minutes. Add more vegetable stock as needed if you want to stretch the sauce. Add the vegan butter, stirring gently and dispersing the butter as it melts. Add the cooked linguini and stir for 2 minutes, evenly distributing all ingredients on the pasta. Remove from heat and add the parsley, stir one more time. 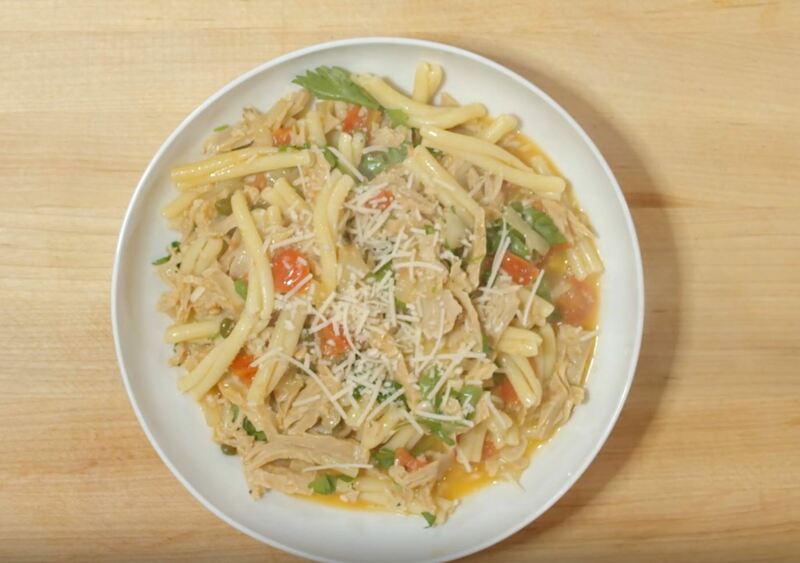 Serve a generous portion and garnish with parmesan. Top with cooked mushrooms, broccolini or other veggies, if desired.